They aren’t really stones. They're pieces of solid material that form in the gallbladder, a small organ located under the liver. Cholesterol stones. These are usually yellow-green in color. They're the most common kind, accounting for 80% of gallstones. Pigment stones. These stones are smaller and darker. They're made up of bilirubin, which comes from bile, a fluid your liver makes and your gallbladder stores. Bile can be part of the problem. 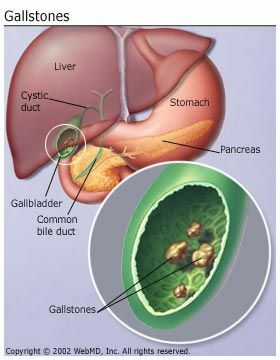 Your body needs bile, but if it has too much cholesterol in it, that makes gallstones more likely. It can also happen if your gallbladder can’t empty properly. Pigment stones are more common in people with certain medical conditions, such as cirrhosis (a liver disease) or blood diseases such as sickle cell anemia. You're obese. This is one of the biggest risk factors. Obesity can raise your cholesterol level and also make it harder for the gallbladder to empty completely. You take birth control pills, hormone replacement therapy for menopause symptoms, or are pregnant. The extra estrogen is the problem. It can increase cholesterol and make it harder for the gallbladder to empty. Gallstones are also more likely if they run in your family, and they're likelier among women, older people, and some ethnic groups, including Native Americans and Mexican-Americans. Ultrasound. This quick procedure makes images of the inside of your body. CT scan. Specialized X-rays allow your doctor to see inside your body, including your gallbladder. Magnetic resonance cholangiopancreatography (MRCP). This test uses a magnetic field and pulses of radio-wave energy to make pictures of the inside of your body, including the liver and the gallbladder. Endoscopic retrograde cholangiopancreatography (ERCP). The doctor inserts an endoscope through your mouth down to the small intestine and injects a dye to allow the bile ducts to be seen. He can often then remove any gallstones that have moved into the ducts. Laparoscopic cholecystectomy. This is the more common procedure. The surgeon passes instruments, a light, and a camera through several small cuts in the belly. He views the inside of the body on a video monitor. You usually go home the same day. If you have a medical condition and your doctor feels you shouldn't have an operation, he may prescribe the medications chenodiol (Chenodol), ursodiol (Actigall, Urso 250, Urso Forte), or both. These drugs work by dissolving cholesterol stones. Mild diarrhea can be a side effect. The downside of using either medication is that you may have to take it for years to completely dissolve the stones, which may come back after you stop taking the drug.